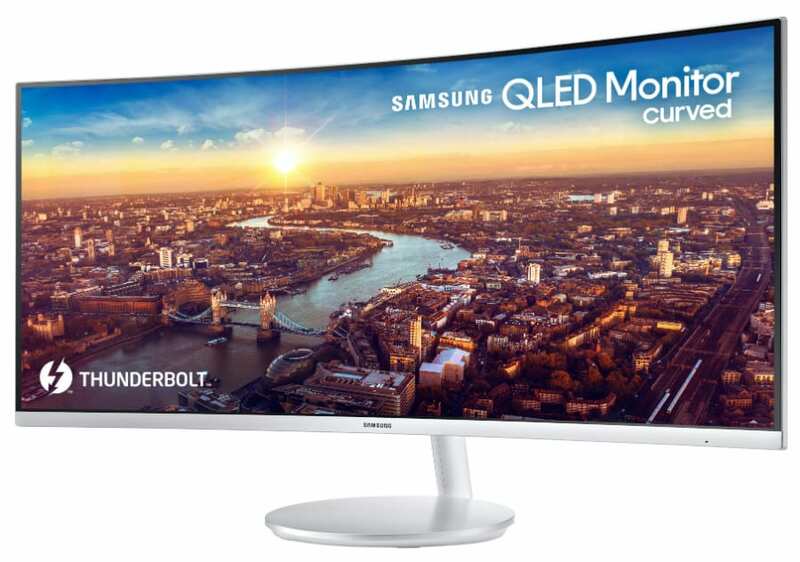 The Samsung CJ791 is the first curved ultrawide monitor to offer stunning images via its QLED-equipped panel and modern functionality via its powerful Thunderbolt 3 connection. 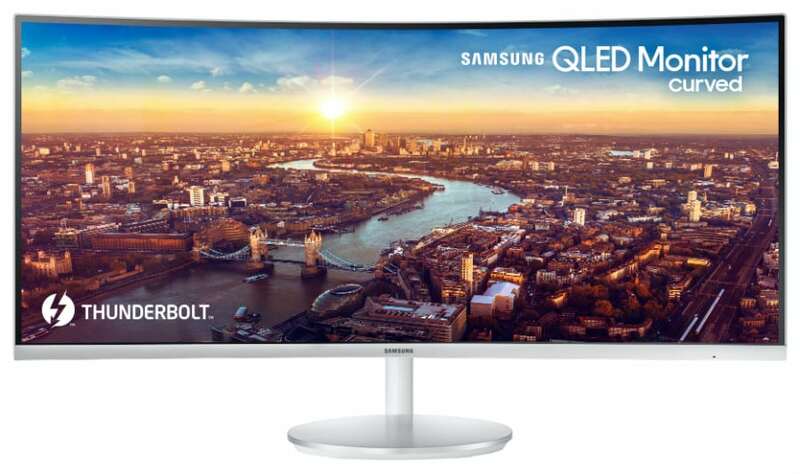 34-inch VA panel models with a 3440 x 1440 resolution have become staple choices in the market, but Samsung’s new baby is poised to push future-proof technology like Intel’s Thunderbolt as part of the mainstream. The Samsung CJ791 could be the perfect dock for your USB-C laptops with its exciting potential as a forward-thinking professional display. Available details are limited, but preliminary images show that the Samsung CJ791 will utilize a similar design to the C34F791 which was a 100Hz gaming monitor with similar panel specs and aesthetics. This new product will include a matte white chassis with silver accents for a design that biases towards professionals who want a luxurious looking display. The screen is bezel-free on three sides, enabling users to enjoy the full magnitude of the 34-inch ultrawide. We are not yet certain if the Samsung CJ791 will include standard connectivity ports like HDMI or DisplayPort 1.2. The focus of this new product lies in its Thunderbolt 3 slot which can transfer 40GB/s of data while transmitting 85 Watts of power to a compatible device. This feature alone can make this device a chart-topping choice for professionals who want a display and dock for USB-C devices such as the MacBook Pro 2017. Since the Korean firm followed an existing exterior design, we can already make intelligent guesses as to how the product will ship in its final form. Like the mechanism on the C34F791, there could be height, tilt, and swivel adjustments to easily optimize viewing angles. A pair of speakers should also be standard, but specs, when the Samsung CJ791 starts shipping, are yet to be finalized. The Samsung CJ791 features a 34-Inch VA panel equipped with a QLED backlight for an extremely vibrant output that beats out conventional WLED implementations. This model will ship with a 3440 x 1440 resolution, a 4ms response time, and a presumed 60Hz refresh rate. A higher limit is not impossible for this model since it might be using a variant of the panel found on the C34F791. The brand’s QLED technology will allow the v to produce 125% of the sRGB color space for extra vibrancy which can be tuned for design or gaming applications. We’ve seen this tech as a viable alternative to OLED based on Samsung’s latest UHD TVs, although for this monitor, that remains to be seen. The extra contrast can also increase the depth of the output, clarifying darker scenes and creating oily blacks which are not possible on typical TN and IPS variants. Also, this form factor provides a resolution that is 2.5 times higher than your typical 1080p display. This aspect is a huge factor for multitaskers who want crisp details and the extra real estate which they can maximize for multiple windows or apps at a single instance. The Samsung CJ791 should also have gaming suitability for casual warriors who want to enjoy vibrant visuals in their selected titles. The Samsung CJ791 might include gaming features such as FreeSync and a 100Hz refresh rate, although that remains to be seen. It’s not impossible for a monitor like this to have the mentioned capabilities since this model has striking similarities with the already capable C34F791, but the only detail we have is that it will include a Game Mode that features dynamic gamma adjustments. The Samsung CJ791 is shaping up to be your best bet if you are looking for a USB-C monitor in 2018. The product offers a proven formula of ultrawide awesomeness coupled with the excellent capabilities of Intel’s Thunderbolt 3 technology. Using a single cable to receive a video signal while being able to charge up to 85 Watts of power will make this device a must buy for your MacBook Pro or similar devices. Samsung plans to release the CJ791 at the middle of this year, with no known SRPs in the global markets. We are expecting a price tag that will exceed a thousand dollars which can be considered as a valuable investment if the product performs as promised. If you are interested in the Samsung CJ791, c keep checking this page for the latest updates and news on this professional monitor. We’re glad you like it, Lily!